Given that Youmu is practically tied with Aya as the fastest of Gensokyo, this is not overkill. It's precaution, and a likely necessity to saturate the area with fire. I feel bad for all those fairies. only 1 charge up slash from youmu and about 90% of them will die. 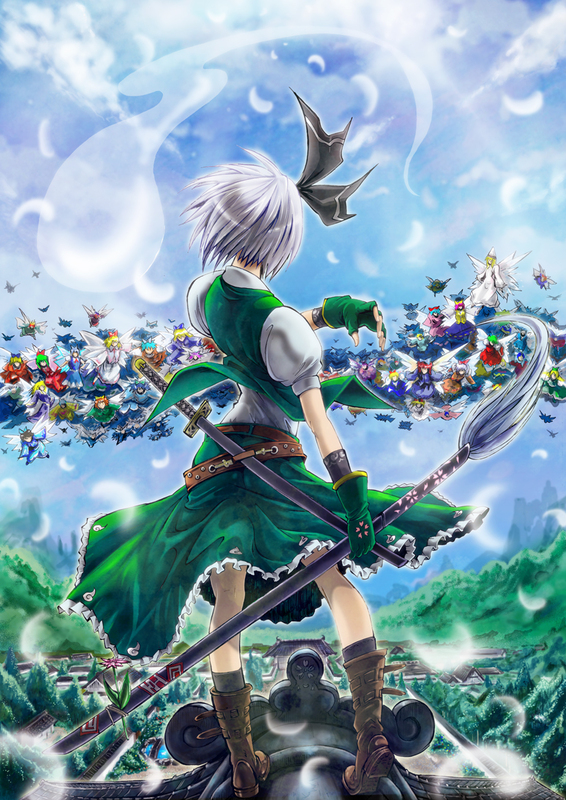 It's time for Youmu...to unleash the Basara. Where the hell is my Touhou Warriors game dammit! Fun fact: Fairies outnumber all of the humans and youkai in Gensokyo combined! Its canon that even Reimu has taken hits from fairies when they attack her in sufficient numbers! That's why Fairy Wars started in the first place. Sunny Milk of the Three Michievous Fairies figured if they could get all of the fairies in Gensokyo to obey them, they'd be able to defeat anyone through sheer numbers! Fortunately for Gensokyo (and Reimu) the Three Fairies have the attention spans of gnats on crack and they were drunk when they came up with that plan in the first place! not to mention during the full moon faires go EX there really lucky they never had to deal with a EX Cirno. I'm getting an Inuyasha vibe...like Youmu is about to pull something like the wind scar on them all. Just a normal morning of her gardening work. Going to need at least 30 more fairies. Not enough for an Overkill. Youmu can take them all out with one single move. Or perhaps Letty could have soaked some of that damage as well and saved a portion behind her? Nice try, but Letty isn't here, or even a fairy. This is actually a common feature of all fairies. The Great Fairy War was delayed by several months because after the initial incident which sparked it, because Cirno was having too much fun trying to freeze the lake and didn't remember she was supposed to "get back" to the three. With Cirno among them we probably have a real fight. Well Aya is teh fastest person in Gensokyo alive. And, Youmu is teh fastest in Gensokyo... HALF-ALIVE.